A New Jersey man was charged with vehicular manslaughter after a boat crash near the Statue of Liberty that killed a groom-to-be and injured two other men. New York City police said 39-year-old Richard Aquilone of Jersey City, N.J., was out on the water Friday evening with his wife, their 2-year-old daughter and two sons, ages 2 and 3, when their 30-foot boat hit a smaller craft. Police said Jijo Puthuvamkunnath, 30, of Bergenfield, N.J., and two friends were in the 17-foot boat anchored off Liberty Island that was struck by Aquilone. Puthuvamkunnath was taken to Jersey City Medical Center, where he was pronounced dead of head injuries. His two friends, both also 30, were treated for minor injuries. 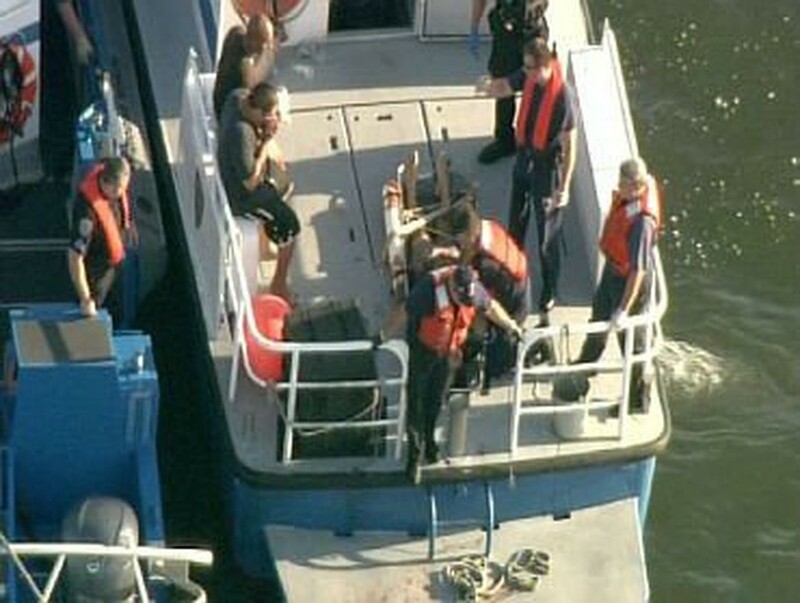 In this July 2, 2010 image taken from video and released by WCBS-TV in New York, rescue teams respond to a fatal boat accident near the Statue of Liberty in New York Harbor. No one on the larger boat was injured. Aquilone was arrested on charges of vehicular manslaughter, operating a vessel under the influence of alcohol or drugs and endangering the welfare of a child. He was arraigned on the charges Saturday. A spokeswoman for the Manhattan district attorney's office said Aquilone pleaded not guilty and bond was set at $50,000. She did not know the name of his attorney. Puthuvamkunnath was due to marry his girlfriend, Sissy Chacko, on Aug. 28, said his aunt Aleyamma Varughese, who answered the phone at Puthuvamkunnath's home Saturday. "He was a very, very wonderful young man," Varughese said. "He was loved by everybody."